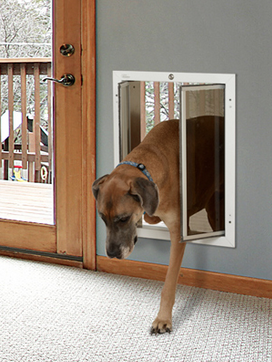 A pet door can be installed through a house door, a wall, or even a window. Many choose to install their pet door in a house door, because it’s a fairly simple installation and easy to restore – just replace the door. But, there are other options. Many pet doors are available as wall kits and can be put through pretty much any type of wall. This is a bigger installation where the level of difficulty depends on the material in the wall, and most choose to get help from a professional. The end result can look phenomenal. Things to keep in mind when choosing a spot for a wall installation is not going too close to the windows – and watching out for things like electrical wiring, pipes, and AC duct work. It’s a good idea to choose a backup installation spot in case “Plan A” falls through. It is also possible to install pet doors through glass, for instance a window or a sliding glass door. Doing this requires a new pane of glass – the pane you already have is tempered and can’t be cut. Take a look at plexidorglass.net for some examples of installations.